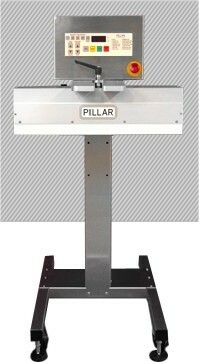 New Pillar 2KW-U Line Cap Induction Sealer. Includes: a waterless cap sealing system, 2 Kw power supply with microprocessor control, Stainless Steel enclosure, fully adjustable output, customer interlock/run signal, adjustable loss of seal alarm. Features: Waterless universal sealing coil designed to seal a wide range of caps. Comes with a conveyor mounted coil support with height adjustment and Quick connect electrics. Includes portable Stainless Steel cart on casters with threaded leveling feet. Electrics: 1Ph/60Hz/208-230V. Speeds: up to 180 feet per min. Delivery: 1 week from receipt of payment.